The rampant runaway success of Final Fantasy on the NES left Square, Inc. in a bit of a spot. They had a couple more games ready for the Famicom, but the Super Famicom was right around the corner, and the localization process for these two NES games was just in the planning stages. Funds seem to have been reallocated to Final Fantasy IV's localization at some point, and II and III were simply skipped over. 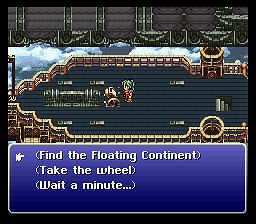 Thus, when Final Fantasy IV came out here in the USA, they renamed it 'Final Fantasy II' and moved on. This modification to that game was originally a lot more daring in its alterations to the script, due to the patch author's misinterpretation of what was available, FF Fan Translation-Wise, at the time; what was and was not acceptable seemed apparent, but then, the medium of game modding doesn't really have acceptability guidelines, in the long and short of it. Woah! Last time I played Stand Guard I think it was version 3.0 or something. O_o And I liked it so much. Now version 6.2? Man! Feels like I was living under a rock while your were working so hard on this one. Anyways. Thanks for the heads-up, I bet I'll enjoy this. It's great to see my hand cursor put to good use ! And a mighty fine job you did on it, too. I included a list of possible bonuses in the Ghost's lines of dialogue, which teach you how to use Espers (or Eidolons as I call them in this version), but I forgot to include MP+50%. ^_^ But the good news is I don't actually care. The mod's originally cringy dialogues was the main reason why I never went very far with it. That's a nice-looking hand cursor. 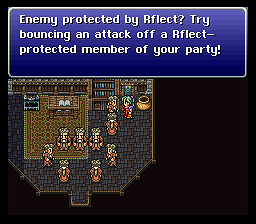 FF7 has one for in-dialogue choices, so now FF6 has one, also, thanks to Bregalad. Cool! Like Croc, it been a while since last looking at this mod. Gonna have to sit down with it! A 16-bit character in a 2-bit world. Does this apply on a previous rom hack or something. It doesn't work only any NOINTRO rom, or with headers added, and the checksums posted don't match. Applied anyway, it just starts with a blank screen and music. It's probably better to make the patch for a clean unheadered rom. Version 6.3 with the MP+50% bonus listed by the Ghost is submitted. Woowoo. I had this tab open while trying to figure out what song had the lyric "Mama take a walk outside" the way I was hearing it...but it's "Take a look outside." Thus, it took a while to remember which song it was. Did you expect a FF6 nerd to be a normal person? This is for posterity, so ... be honest. Weekend Update: 6.3 is now up at the site. It requires, as I've said, a headered rom this time, as this was easier than explaining to someone how to take a header off if it is indeed present. Tush is the utility which will tell you whether there is a header already present on the file or not. That's in Utilities <-- Over there on the sidebar (edit: From the front page...man I haven't gotten used to this new layout yet). LunarIPS, same deal, in the Utilities section. I don't know if I'll do much more in the way of software editing...frankly I'm more interested in music, and I don't feel a creative feeling from making games, for whatever reason. It seems like lots of mouse clicking and hunt and pecking when you're not actually typing up the script itself. Formatting takes forever if you want to do something the text wasn't designed to do, in this case show Character Names on their own line, then have the text below indented, FF7-Style. This took...for...freaking...ever. I mean it took forever, and good gobs of gopher gravy it was frustrating. Worst part of having done it. Random Trivia about the news post: I don't know why I listed Sean as a name I changed and not his mom Mina. There are probably other NPCs whose new names I kept too. Interesting bit: Since the Japanese version calls Arvis "Jun," but neither version gives him a last name, I combined them: his name in this version is "Jun Arvis," but he is always referred to as "Arvis" except once or twice, for example, when Banon gets back to Narshe with Terra and Edgar. You are the boon of all spoons my man! Thanks 6.3.1 went up yesterday...apparently I overzealously typed the word 'gone' twice at some point in the Imperial Banquet dialogue. What is the difference between this version and Woolsey's script? I've never played this before.